Moments ago I was staring at my manuscript – drawing a complete blank. I don’t remember what I wrote yesterday, the day before that, all month long. Worse I’m not even sure what I’ll write next. It’s not that the voices are silent (gods I wish) no, it’s more like they’re holding their council and I don’t have high enough clearance to know what’s going on. I’m finally done being sick but my head is full of book covers as I try to finish mine off as quickly as possible. When I say my head is full of book covers, I mean it. Not just the elements to pull together to make my book cover but also what makes a book cover really stand out and stick with you. That makes me think of my all time favorite book cover. 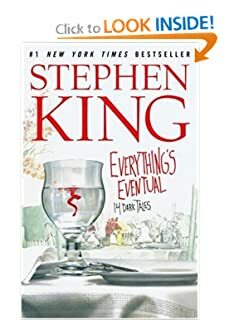 My favorite book cover design of all time is Stephen King’s “Everything’s Eventual,” designed by Mark Stutzman. On the front is a bight scene. Tableware is laid out neatly on crisp, white linens and in the background there’s just the hint of another table, letting us know that this idealistic place setting is probably in a restaurant. Slightly off center in the foreground is a water glass full of clear water in which swirls one drop of red color. It is bright. It is beautiful. It is idealistic – and there’s something very wrong here.